This was my 2nd time going to Toby’s and was our last stop on the Brooklyn pizza tour. 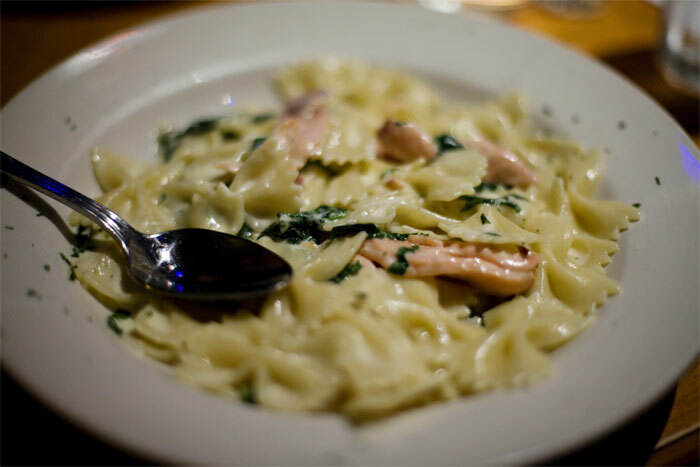 By then Mo, Howard and I were stuffed up with pizza but since it was our last stop we went all out. A table full of Old Speckled Hen is pretty eh? 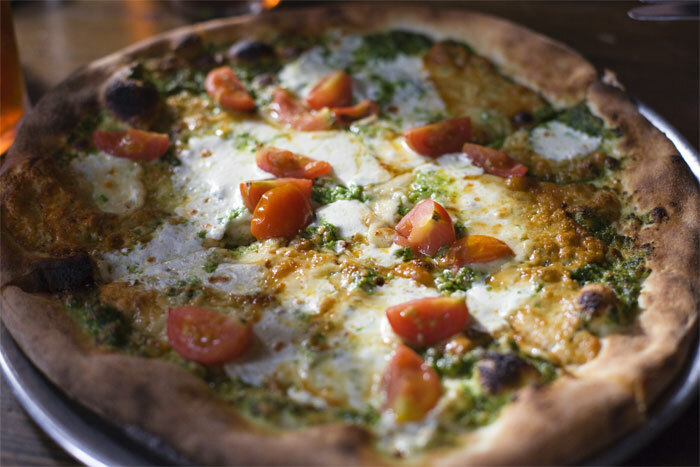 Dramatic lighting on my spicy pecorino pizza. Ah. 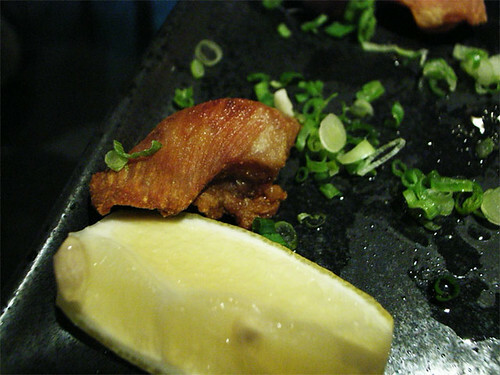 My friend Jane and I occasionally hang out at Hagi for their soft shell crab. At our more recent trip we sorta went all out a bit and ordered few dishes we normally don’t order. 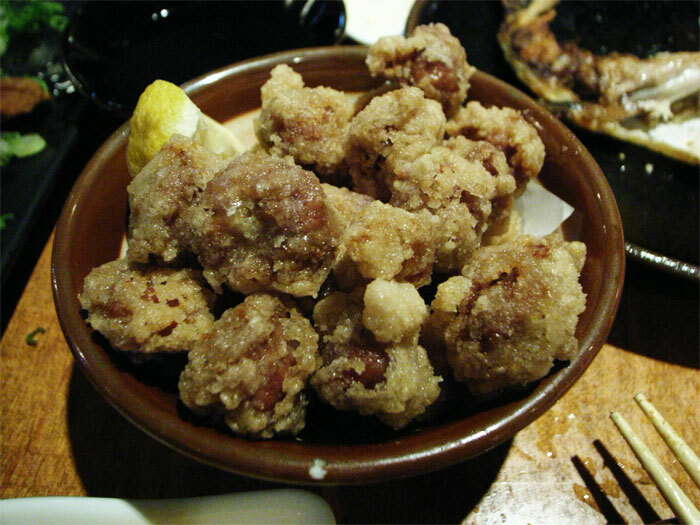 Like the fried chicken gizzard, above. The gizzards were okay, the outer fried batter didn’t stick to the gizzard and all. It was kind of disappointing. The plate of fried pork belly was amazing! 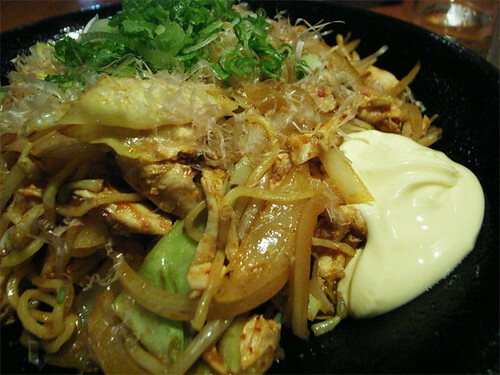 The very last thing we ordered was a plate of yakisoba and it came with a big pile of Japanese Kewpie mayo. Now I love Kewpie mayo but thought it was waaaaay too much with the noodles. 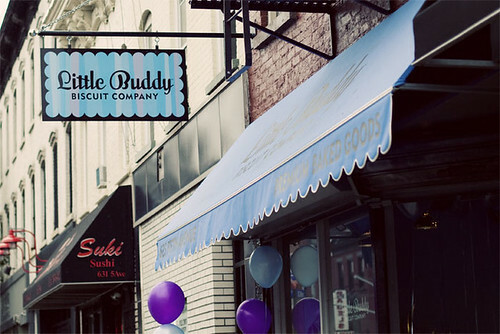 The day that Howard and I went to Little Buddy was their grand opening day. 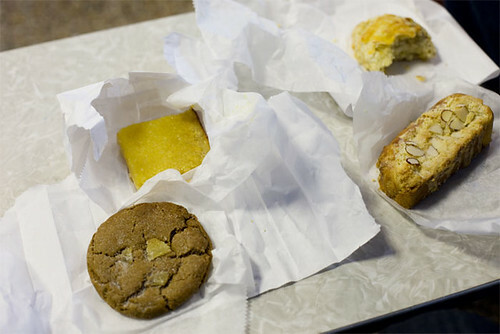 I tried their ginger and molasses cookie and a lemon tart. Both were very good. 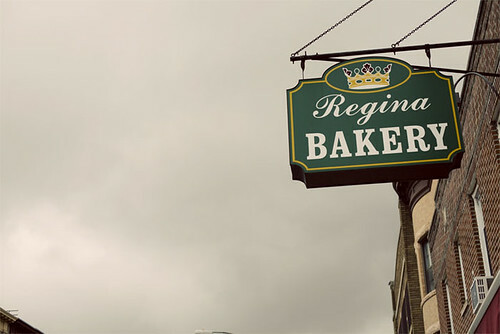 I walked Regina’s a lot and everytime I was tempted to go in and get something eat. Finally 1 day Howard came with me. I was said to find out that they don’t bake their own stuff. 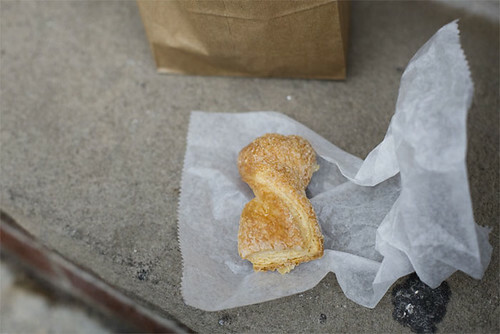 Boo The few pieces of baked goods I got were okay. Steph and I weren’t sure where to get brunch so she pointed out Cafe Luluc. She’s been there and said it was okay. 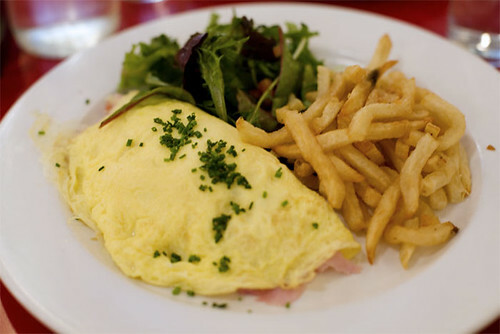 I got an omelette, I THINK it was stuffed with ham and cheese. I really wanted toast with the omelette. I realized I didn’t want fries with my eggs I wanted hash browns or home fries. 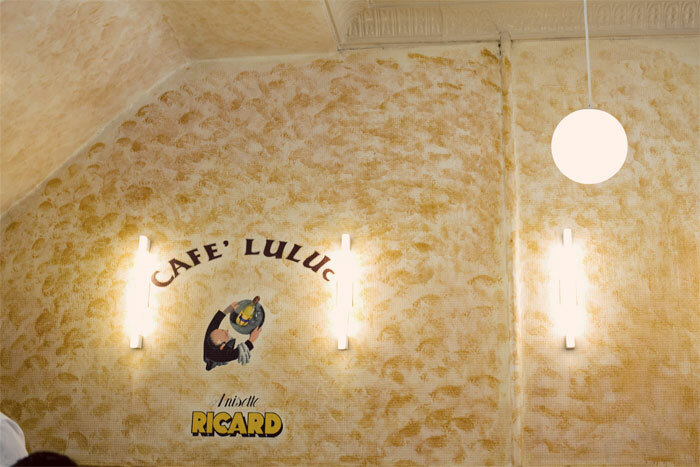 In the end Cafe Luluc was just okay. 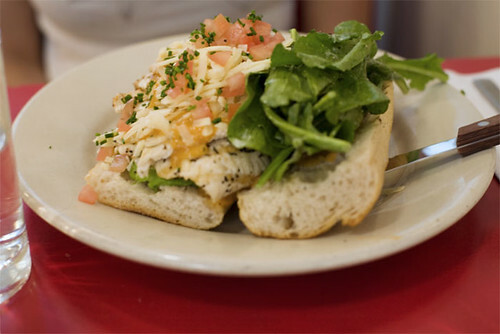 Another skippable restaurant is Union Cafe on Smith St in Carroll Gardens. I’ve been there twice and their food was just so-so. I love Cafe Zaiya even though last time I went I found a bug in my sandwich. Hm…. 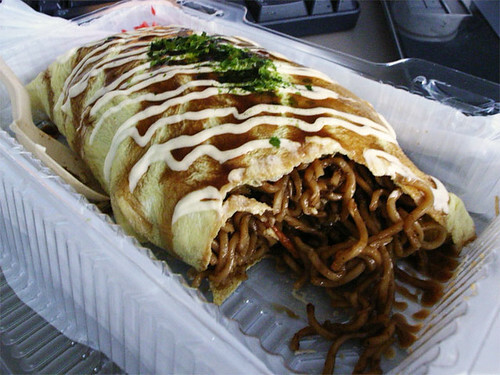 So I saw on a blog that they were selling these yakisoba wrapped in an omelette. I went and got 1. I had no idea that it was HUGE! 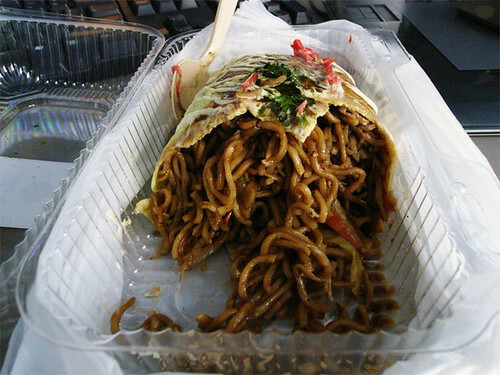 That day, I think, I ate about 2lbs of yakisoba. Will I get it again? Frak yeah!